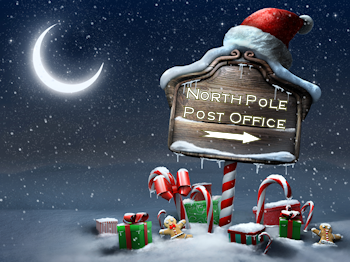 Thank you for visiting the North Pole Post Office Online. We hope to make your connection to Santa or anyone at the North Pole you need to reach quick and easy — simply click on the links below! Email Santa — Your electronic mail message to Santa is secure and will reach him instantly no matter where he is in the world. Ask any elf a question — Elves are the North Pole are standing by to take your question, 24/7 and 365 days a year. Naughty? — Santa doesn’t officially have a naughty list. But if you’re feeling a little guilty maybe we can help. Help name Santa’s Sleigh — Every year Santa gives his new sleigh a name. And it is always a girl’s name. He names a winner in the sleigh naming contest every year just before he launches on Christmas Eve. Catch Someone Doing Something Nice — Know someone who has been extra nice? Tell Santa about it! Name Santa’s Baby Reindeer — Thousands of baby reindeer are born at the North Pole every year and Santa needs help coming up with ideas to name each little girl reindeer and each little boy reindeer. Have an idea for a name? Suggest it to Santa!